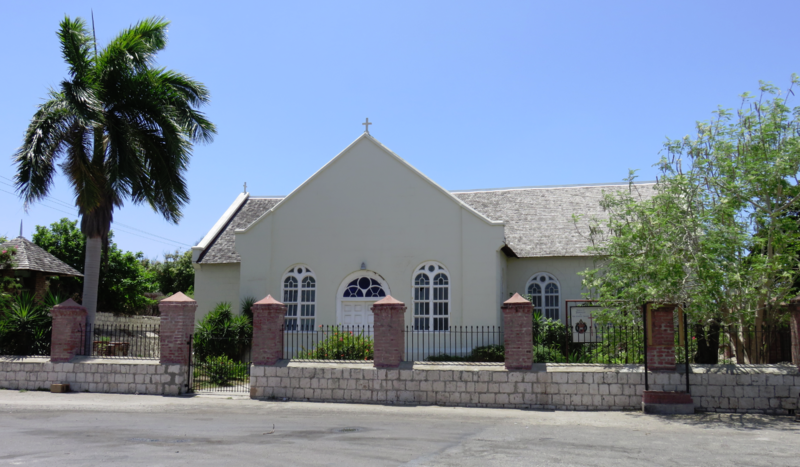 The original parish church was destroyed by the great earthquake of 1692. A second church built shortly after, was destroyed by the 1703 fire. 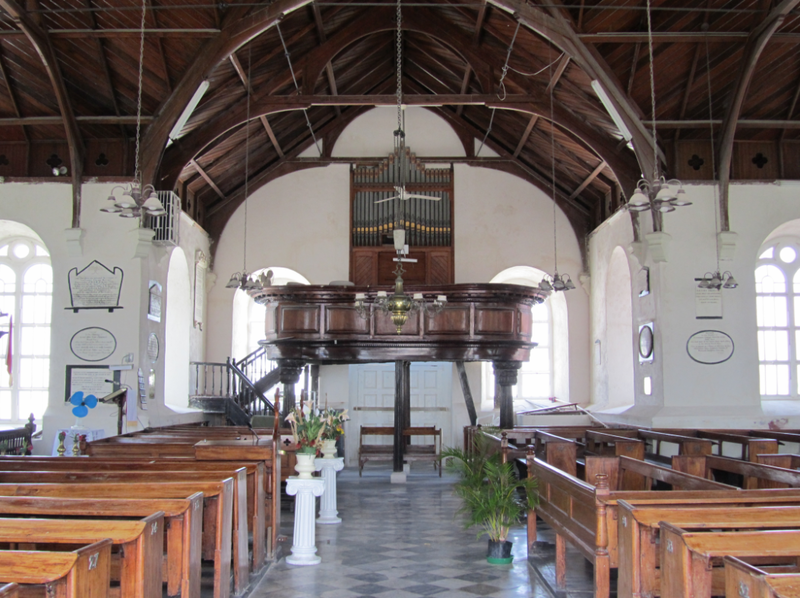 The current church was rebuilt in 1725-26 when James Clark and Lewis Galdy were church wardens. Here Lyes the Body of LEWIS GALDY Esq. 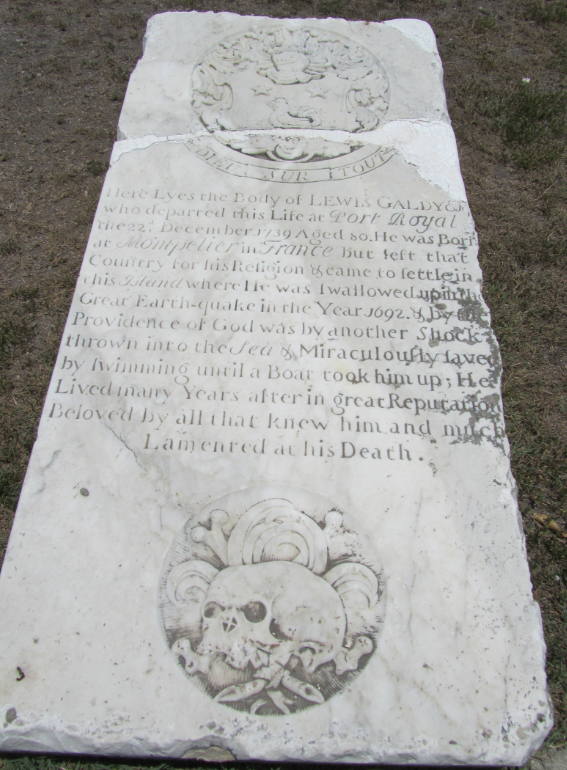 who departed this Life at PORT ROYAL the 22nd December 1739 aged 80. He was born at MONTPELIER in FRANCE but left that Country for his Religion & came to fettle (settle) in this ISLAND where He was fwallowed up in the Great Earth-quake in the Year 1692 & by the Providence of God was by another Shock thrown into the Sea & Miraculoufly favey by fwimming until a Boat took him up; He Lived many Years after in great Reputation Beloved by all that knew him and much Lamented at his Death. 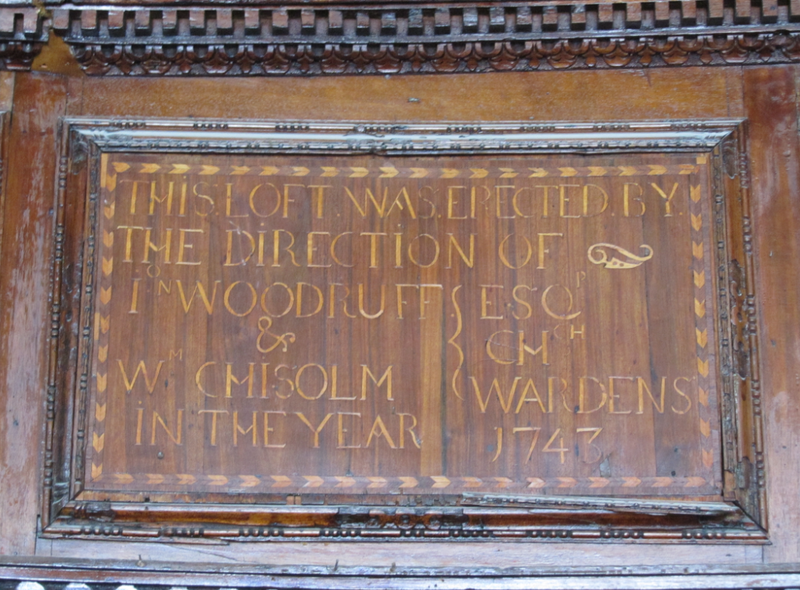 and Captain William WAKELIN Late Commander of HMS “Suffolk” who departed this life 7th October 1705 aged 46 years…………. Underneath this stone lie interred the remains of Capt. Hutton DAWSON of the Royal Navy who fell a victim to a violent fever which in a few hours terminated his existence the 11th of February 1813 aged 21 years. Lieut: H.P. TAYLOR., R.N. (of Kingston, Surrey, England) …..20th 1819……on board HMS Sloop Beaver off Jamaica. The original Black and white paving can still be seen inside the church.. Lieutenant Joseph Andrew [….??? tablet broken], late commanding her Majesty’s Schoo….???. He had served the country upwards of ……and died of Yellow fever on the 9th Feb…….age 49. The Revd. Charles F. HALL, Rector of Port Royal who departed this life Sept 28th 1855 aged 54. Sacred to the memory of the undermentioned Officers and Men of H.M.S. Leopard. 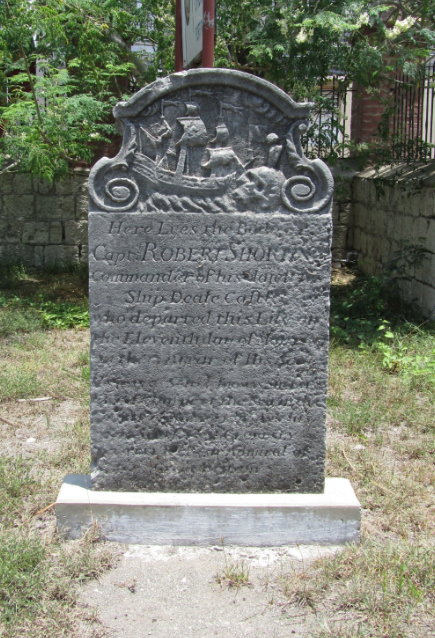 Mr. R. SMIRKE, Naval Cadet, who fell from aloft at Belize 13 April —- aged 15. H. BOARD, Boy – 24 Apr 1858 age 16. J. CUNDAY, Caulker – 25 May age 48. The Revd. Thomas MUTTON, B.A., Chaplain of H.M.S. Urgent who died at Port Royal 27th Feb 1901 aged 29 years. This tablet is erected by Captain William HOBSON, of his Majesty’s sloop, Ferret, to the memory of his nephew, Mr Thomas McGWIRE, late a midshipman of that sloop, who died of yellow fever on the 23rd Sept 1825 aged 15 years. He was a youth whose virtues endeared him to all who knew him and rendered him the idol of his uncle’s heart. To the memory of the Officers and Men of HMS Rainbow who died of fever whilst at Port Royal between the 31st July and 28th of October 1835. Sarah Ann, wife of the Reverend Thomas Bryett Turner, Rector of this Parish. Aged 29 years. Died 20 Jul 1856. ALSO Rev Thomas Bryett TURNER….who departed this life 29 Jan 1866 aged 65 years……. Anna W. St JOHN who died 30 Jul 1836 aged 24 years and 3 months….. In Memory of the undermentioned Officers and Men who died at Port Royal in the autumn of 1897. Lieut: John Love HAMMICK, Royal Navy who died here of the Yellow fever 11 Jul 1810 in his 23rd year…..
Gunr. W. FRITH – died 11 Feb 1913…..
John MacNAMARA Esquire, M.D., Surgeon of the Royal Naval Hospital…died 3rd Aug 1820 aged 33 years…. Erected by the Officers, W.O’s N.C.O’s and men of the 10th Heavy Batt. R.A. and Brethren of the Arawak Lodge R.A.O.B. G.L.E. Horace BAYFIELD Esq., of H.M.S. Confiance…died 23 Dec 1819…. Ebenezer SCOTT, M.D., Surgeon of H.M.S. Cornwallis…died of fever at Port Royal 30 Dec 1838…..
Sacred to the memory of the undermentioned N. C. Officers and men of No 5 Batt. 10th Bde. R.A. who died at Jamaica during the year 1878. Sacred to …. Lieutenant PHILIP FROWD, of the Royal Navy, who died here of the Yellow Fever April 15th 1804, in his twenty fourth Year. Sacred to….Brevet Major HENRY PEIRCE, Royal Regt. of Artillery who died at Port Royal 23rd Sept A.D. 1824, aged 41 years. Midfhipmen of H.M.S. 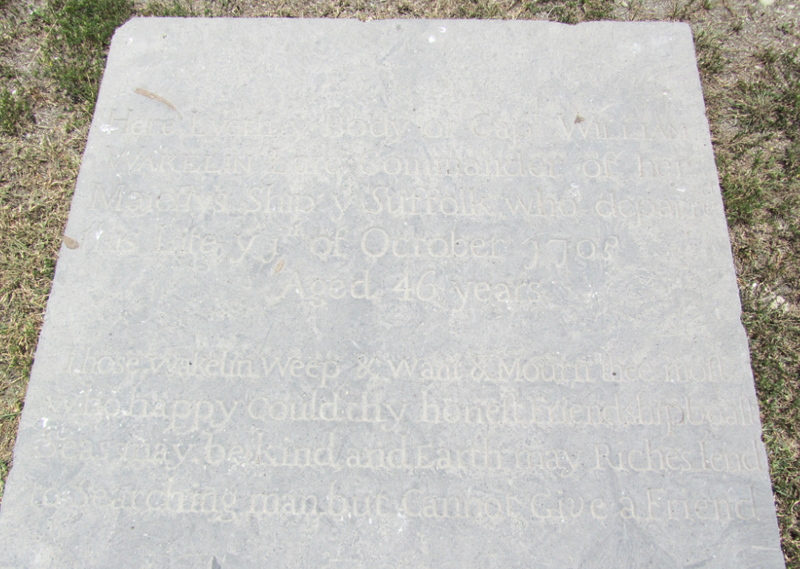 “Sapphire” who died of the Yellow Fever at Port Royal in June 1820. Sacred to…..THOS: J. GRAHAM, M.D. and 16 Seamen of the Ship Pantaloon who died from fever between Belize and Jamaica. Of No. 7 Battery 1st Brigade Royal Artillery, who died at Port Royal in the year 1866-7. This tablet is erected by their comrades in token of their friendship and remembrance. Sacred to….Lieutenant and Quartermaster JAMES FROST. Royal Engineers who died at Port Royal Sept 25th 1900, aged 46 years. Sacred to….of the Officers and Men of H.M.S. “Imaum” who died of Yellow Fever in Oct and Nov 1860. BOYS – George W. LYALL; Edward BARBER; James CLAMP; John DEA; George McLEAN; Thomas FLYNN; John MARKHAM; John TIMOTHY; Robert LEGGETT; John WYATT; Edward HOLMES. Sacred to…ALEXANDER CARTER RUSSEL, Captain Royal Artillery. 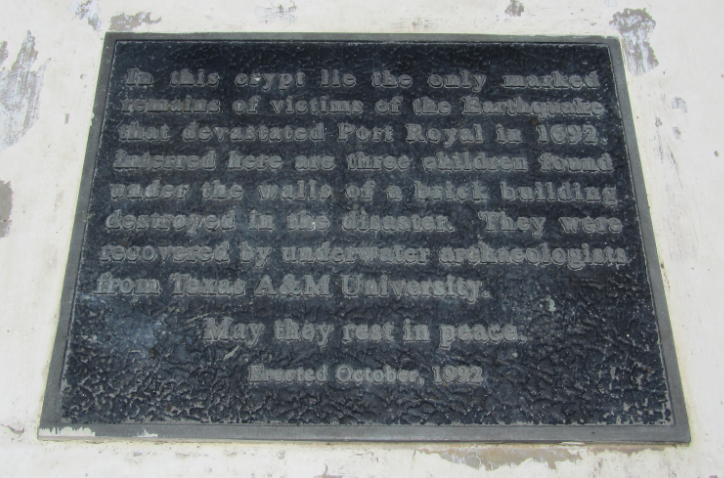 Who died at Port Royal on the 18th Nov. 1903. Sacred to…GEORGE EDWARD OUGHTON, Gentleman, R.N. ……who departed….4th Aug. 1832 aged 28 years. SEAMEN – James H. COOK; Charles McCARTHY; Henry ROBINSON; Henry BENNETT; George DUNN…of Her Majesty’s Ship “DARING” Commander Gerard J. NAPIER who were drowned on June 23, 1853. Near lye inter’d the Remains of WILLIAM STAPLETON Esq., Lieutenant of his Majesty’s Ship Sphinx. …….died 8 May 1754 age 28.
members of he Jamaica Defence Force Coast Guard who, with M/V Dusty III, were lost on the night of Thursday, January 4th, 1990, off Morant Point, St Thomas. Sacred to….ELLIS WALTON RUSSELL…died 2 Aug 1927, aged 78. Sacred to….JOHN ERNEST NEAL, Esq., born in Mistley Essex, England. Died 27 Feb 1947 age 65. Sacred to…Lieut JAMES WILLCOX. Royal Navy H.M. Sloop “Wolverene”…died at Port Royal 14 Oct 1855 age 24. Also THOMAS BOUGLARE Private Royal Marine Lt. Infantry. Sacred to….GEORGE BLOOMFIELD GARVEY, Lieut. & Adjutant Royal Artillery died at Port Royal of Yellow Fever Nov. 19th. 1853, aged 23. Also of Lieut. ROBERT LEONARD Royal Artillery who died the following day of the same fatal malady aged 22. Sacred to….AUGUST JAMES CHAMPION DE CRESPIGNY, third son of Sir W. Chn: and Lady Sarah De Crespigny who died on borand H.M. Ship “SCYLLA” Oct 24th 1825. In Memory of EDWARD JOHN PRETYMAN Sub Lieut. Royal Navy, H.M.S. “Royalist”, who died at the Naval Hospital, Port Royal Feb 20th 1871 aged 23.